Explore, Learn, Have Fun! 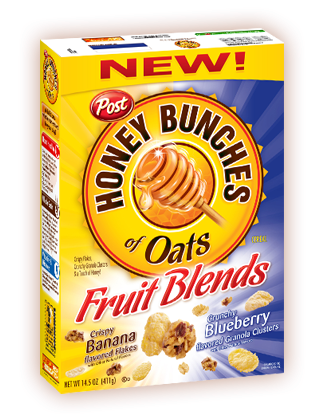 : Giveaway ~ Post Honey Bunches of Oats! Giveaway ~ Post Honey Bunches of Oats! My family loves cereal! So much so, that I usually have at least 10-20 boxes in my stockpile. I buy it on sale/with coupons when it's cheap so we always have plenty on hand for easy breakfasts, snacks and sometimes even for dinner! So you know I was really excited when I was asked if I'd like to try Honey Bunches of Oats AND give away coupons for FREE boxes ~ of course!! My kids were ecstatic when the package arrived - they LOVE Honey Bunches of Oats! It was immediately opened for an afterschool snack! They loved that Post has added even more granola bunches into each box. This is a snack I feel good about letting my kids enjoy with skim milk. We've been enjoying Honey Bunches of Oats for years, and will continue to do so. How about you? Does your family like this yummy cereal? Would you like to be one of my winners? Two lucky readers will each receive coupons for two free boxes of Honey Bunches of Oats, up to $4.49 value each! Click on the read more link to enter via Rafflecopter! Disclaimer: Purex & Post provided me with a box of Honey Bunches of Oats for my family to enjoy and the coupons for free cereal for my readers. My opinions are my own, my participation in this promotion was completely voluntary! I'd like to try Vanilla Bunches and Pecan Bunches. I already have tried the Almonds and love them. I'd get the pecan bunches! I love those! I would choose the Original Honey Roasted and Vanilla Roasted. I'd like to try the ones with almonds, and the one with pecan bunches. I want to try the Raisin Medley..I usually just buy the Cinnamon Bunches :) thanks! i wan tto try just bunches! Thanks for a super giveaway! I would stock up on the Honey Roasted. My son clears the shelf!